Edinburgh have handed a debut to Scotland Under-20 international George Taylor for Friday’s tricky Guinness Pro14 clash against Munster in Cork. Taylor comes in at outside centre in a much changed capital XV. With back-to-back Champions Cup games coming up against Newcastle followed by the 1872 Cup double header against Glasgow Warriors, Edinburgh coach Richard Cockerill has utilised his full squad for the game at Musgrave Park. 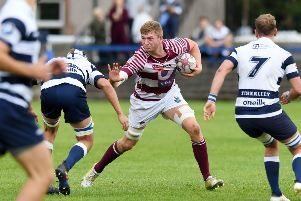 Taylor, who signed his first professional contract at the end of last season, is a Scottish Rugby Academy graduate and was a key player for Melrose last season as they won the league and cup double. He is named alongside Argentine centre Juan Pablo Socino in midfield, whilst Nathan Fowles and Jaco van der Valt start at scrum-half and stand-off respectively. Cockerill, said: “We’ve got a young group again, but part of our development as a squad is that we have got to put people in a position to grow. In the forward pack, Cockerill fields a fresh front-row trio of Rory Sutherland, David Cherry and Murray McCallum, whilst Lewis Wynne makes his first start for the club in the back-row. Scotland internationalist Darryl Marfo is named amongst the replacements. Substitutes: 16. Ross Ford; 17. Darryl Marfo; 18. Pietro Ceccarelli; 19. Callum Atkinson; 20. Senitiki Nayalo; 21. Sean Kennedy; 22. Jason Baggott; 23. Chris Dean.